She was a lot of fun to plush! I really adore her beautiful design. The biggest challenge was her tail – I wanted it to be a continuous flowing piece, but it had both “3D” and “2D” elements that was tricky to translate to plush form (tricky for me at least x3). There’s quite a lot of internal structuring going on in that tail and I’m really pleased with the end result. 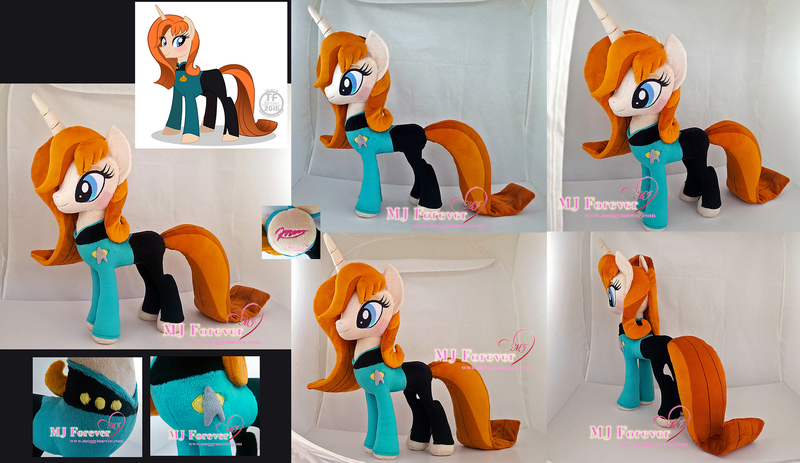 Her facial blush was airbrushed on and adds a nice splash of colour to her face ^^ her golden pips and communicator badge are both 3D and sewn on. Thank you so much for commissioning me everdeer!!! !